Planning is a important part of SAP controlling and here we are going to discuss further aspects of that in the present post. Cost center planning forms part of the overall business planning process, and is a prerequisite for standard costing. The main characteristic of standard costing is that values and quantities are planned for specified time frames, independently of the actual values from previous periods. In the planning you determine the control criteria for your later analysis.For the cost planning, you can compare the plan and actual costs per area of responsibility after the period-end closing. - You can analyze your area of responsibilities based on target costs. This enables you to assess performance, not only based on plan data, but on target data as well (control of management effectiveness). - You can carry out simulations with various outputs, which automatically trigger cost calculations; here, only the variable costs rise (plan reconciliation). - You can also determine the cost of an additional activity unit (short term lower price limit, marginal costing). Periodic repostings are used purely as a posting aid.Primary postings (such as telephone costs) are collected on an allocation controlling object to minimize the number of postings to FI. These costs are then allocated to the appropriate controlling objects at period-end closing according to a user-defined key (fixed amounts or tracing factors). The sender controlling object can be a cost center, internal order, or other object. You can specify the allowed sender and receiver objects for periodic reposting in customizing. Only primary costs can be reposted. The original cost elements are retained on the postings to the receivers.Distribution is intended for the transfer of primary costs from a sender cost center to receiver controlling objects. Only cost centers may serve as senders in a distribution.Primary postings (such as energy costs) are collected on a service cost center and allocated according to user-defined keys.Only primary costs can be distributed. The original cost elements are retained on the postings to the receivers. Assessment is designed for the allocation of primary and secondary costs from a sender cost center to receiver controlling objects. Only cost centers may serve as senders in an assessment.Primary and secondary postings are allocated according to user-defined keys.In the assessment framework, the original cost elements are grouped together into assessment cost elements (secondary cost element category = 42). The relationship between original and assessment cost elements is defined in an allocation structure. When using the Cost Allocations costing option, planning is not required. But if planning is done, only costs are planned. 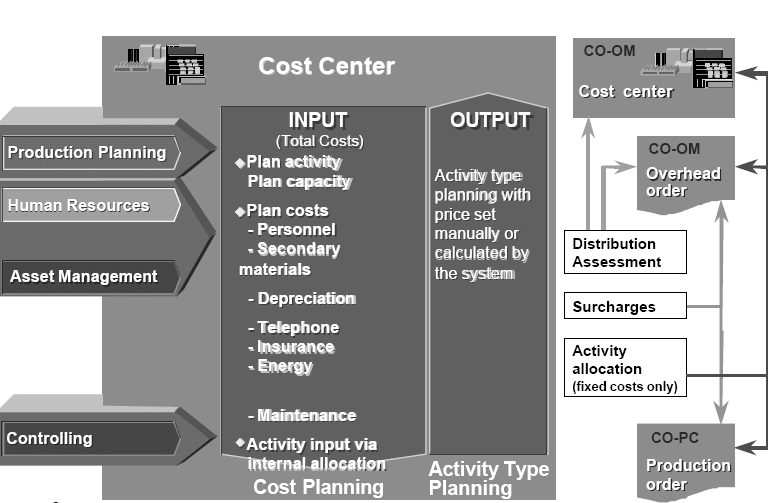 If costs are planned, then it will be possible to do analysis on actual costs compared with planned costs.Plan costs can be entered manually or transferred from feeder systems such as Human Resources (HR), Asset Management (AM), and the Logistics Information System (LIS).Several cost allocation tools can be utilized when planning costs. Distributions, assessments, and surcharges can be defined and calculated for plan costs. These essentially simulate the allocations of actual data that are anticipated for each period of the fiscal year being planned. When using the Activity Type Allocations costing option, planning is essential. Costs are planned, as before, but activity type quantities are also planned. This refers to the number of units of each activity type that is expected to be performed by a cost center.Since both costs and quantities of activity types are planned, it is possible to calculate a unit cost for each activity type. This is referred to as the activity price. The system can calculate these activity prices automatically once the planning has been completed. It is also possible to set activity prices manually. Activity type allocations can now be planned. This is called activity input planning. It involves planning a specific number of units of a given activity type produced by a given cost center that will be consumed by a receiver cost center (or internal order). Activity input planning results in quantities of activities “scheduled” to be consumed, which permits the manager of a cost center that produces activity units to see what quantity will be required. Activity quantities planned to be consumed by other cost centers, by planning integrated internal orders, and by production (via Sales and Operations Planning) are visible through reporting. This visibility facilitates plan reconciliation between activity quantities scheduled to be consumed and those planned to be produced by a cost center. When using the distinction between fixed and variable costs, cost planning includes classifying costs as activity-independent or activity-dependent. An activity-independent cost is expected to be incurred without regard to the output of a cost center; that is, whether or not an activity type is produced. It can be thought of as a fixed cost. By contrast, an activity-dependent cost is planned in conjunction with the production of a given number of units of an activity type. An activity dependent cost is typically a variable cost, although it can incorporate a fixed cost portion. Example: An activity-dependent natural gas cost is planned in conjunction with an activity type for industrial blast furnace operating hours. Most of the planned gas fuel cost would be variable; that is, it would vary depending on the number of hours of furnace operation. But some of the cost could be fixed, in terms of the gas required for space heating, even if the furnace doesn't operate at all.With this costing option, when an activity price is automatically calculated by the system, it has both fixed and variable portions, based on the nature of the planned costs. 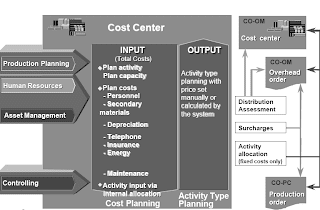 cost management.Additionally, activity allocations can be planned as either activity-independent or activity-dependent (through activity input planning). This can offer greater accuracy in reflecting the true cost origins. By assigning more than one resource to a cost element you can reduce your chart of accounts, without losing any important details for the cost analysis.Example: Cost planning for external training jobs Define the resource master data for SAP courses and business administration courses. Assign prices to the resources, taking into account that the prices of the business administration courses will be higher after the eleventh period. In resource planning, enter the number of course days that you want to reserve for your employees. The R/3 System then automatically calculates the training costs for the planning time frame. You can either select planning that is dependent on activity, or that is independent.You can store different prices for each period in a separate price file, and if required with different dependencies. Resources that you create with a reference to a material are valuated using the price stored in the material master. When you update resource prices, the R/3 System automatically updates your planning costs.You can also copy the resource planning to another version or period. In this case, the R/3 System only copies the usage quantities, at the same time executing a valuation. If this shows that a resource price is 2% higher in the target period than the price of the same resource in the source period, then the costs are also increased by 2%. You can use dependency planning for value-based and quantity-based planning of primary costs that are activity-independent and activity-dependent. The system uses a dependency to calculate the primary costs. This dependency can contain a statistical key figure, or activity types.For dependency planning that is value-based, you plan costs for each unit of a statistical key figure or activity type. For example, 100.00 UNI office supplies per employee, or 3,000.00 UNI training costs per employee. You plan a cost element. Dependency planning that is value-based is typically used in administration. For dependency planning that is quantity-based, you plan resource usage per unit of a statistical key figure or activity type. For example, the usage of course days per employee, or the usage of screws per car. The total planning costs are incurred by the usage per statistical key figure or activity unit, multiplied by the quantity of the object which created the cost, such as, the number of employees or cars, and the valuation with the resource price. Unlike dependency planning that is value-based, you plan the usage of more than one resource and thus detail your cost element planning. Dependency planning that is quantity-based is typically used in production. The SAP system calculates planned costs per period. If you defined different dependency prices, dependency quantities, or resource prices, the system determines a mean value in the overview screen for planning. The exact values are displayed in the period screen for planning.If you change the prices or quantities, the system revalues planning.Unlike resource planning, during dependency planning (quantity-based ) for resource usage, not only is the resource consumption valuated with the resource price, but the dependency quantity is also proportionalized with a statistical key figure or an activity type.SAP provides the standard SAPR&R planning profile with planning layouts for dependency planning (value-based: Layout 1-1R2, quantity-based: Layout 1-1R3). The automatic plan reconciliation is used to check and reconcile the internal activity exchange. Also, if you have the production planning component active, you can transfer the scheduled activities for the production orders to the production cost centers. This approach can, and normally will, result in differences between the activity quantity performed by the sender cost center and the activities scheduled by the receiver cost centers or production orders. With the plan reconciliation, you can adjust the entire plan activity quantities automatically on the basis of scheduled activity on the cost centers . In the next step, the plan reconciliation adjusts the variable portion of activity-dependent primary costs and variable portion of activity-dependent activity inputs according the new plan activity. The plan reconciliation does not change activity independent primary costs, activity independent activity outputs and the fixed portions of activity dependent activity outputs and primary costs. The plan reconciliation is carried out iteratively. This means that mutual activity relationships between cost centers are taken into account. Mutual activity relationships occur, for example, when a cost center plans to consume activity from a cost center, to which it also provides activity.The posting of a plan reconciliation leads to an automatic matching of your planned activities and variable planned costs in the firm. If the indicator for plan quantity is set in an activity type , the planned activity quantity will not be changed in the plan reconciliation, even when planning for the object is not intended to be reconciled.